Shirley Scott’s dressed up for the rock age. The musical garments don’t really suit the experienced, tasteful organist. From the mid-fifties to the early seventies Shirley Scott was one of the most successful and prolific organ jazz players around, presenting a cocktail of standards and bluesy jazz either with her trio or with the addition of Eddie “Lockjaw” Davis and Scott’s husband, tenorist Stanley Turrentine. Her fairly traditional work, perhaps more in the mould of Milt Buckner than Jimmy Smith, is recorded on King, Prestige, Impulse and (with Turrentine) Blue Note. Near the end of the decade Scott signed with Atlantic. Let’s try for something hip, Scott presumably must’ve thought. Her soul-heavy album Shirley Scott And The Soul Saxes sold reasonably well and is sandwiched between her Atlantic debut Soul Song and final release, the less succesful Something. In 1971 Scott switched to Chicago’s Cadet label, adding some challenging originals to her sets of evergreens and contemporary pop and soul. 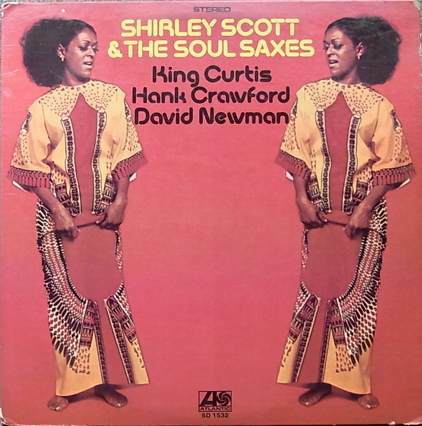 Shirley Scott And The Soul Saxes is not only soul-heavy, but rock-heavy as well. That’s the bad part. But first the good part. Scott turns in tasty performances, she really ‘sings’ on (You Make Me Feel Like) A Natural Woman – the Goffin/King classic written for Aretha Franklin – and her gospel intro on I Wish I Knew How It Would Feel To Be Free is enticing foreplay to a vibrant solo. This bouncy, medium-tempo tune is the album’s highlight. Coincidentally, it’s the only song on the album without horn parts. More Today Than Yesterday – a 1969 hit by The Spiral Staircase – is also one of the better performances. The vibe is relaxed and understatement is the main objective. The album benefits from a tight-knit group of gifted sidemen. However, there are a couple of downsides. Despite the non-pareil funk qualities of drummers Bernard Purdie and Jimmy Johnson, the beat remains mechanic. Moreover, the promising repertoire suffers from bombastic production and arrangements. The sax section does its fair share of harmony, but sax solo’s are few and concise. Ain’t that peculiar? After all, King Curtis, Hank Crawford and David “Fathead” Newman – some heavy artillery there! – are prominently billed on the front cover. It’s a waste of talent. The bits they do contribute are excellent, especially Curtis’ solo on The Isley Brothers hit It’s Your Thing. Guitarist Eric Gale had talent in abundance, but it seems he ended up at the wrong session. Considering Gale’s overdrive guitar sound and distorted licks, a sparring date with Jimmy Page of label mates Led Zeppelin would be more on target. The low point of the album is The Beatles’ Get Back. Its ridiculously fast tempo and over-excited ambience overshadows the solid statements by Shirley Scott. That Atlantic Records lay heavy stress on a rock sound is unfortunate. A more sparse, earthy and less frenzied approach such as the label used for soul stars like Aretha Franklin and Wilson Pickett would’ve benefited Shirley Scott much more. Sometimes dressing up an artist for the new age can only go that far.